.....As this newsletter is being written, total Quickie Kit sales are approaching 245. The delivery time on the Quickie Aircraft Kit and/or Quickie Engine Installation Package is back down to 5 to 7 weeks, after having ballooned higher in January and February. We appreciate the patience of our customers. .....In late February, in order to make the kit more affordable, we decided to separate the Quickie Engine Package into two separate parts; the Quickie Engine, and the Quickie Engine Installation Package. The Quickie Engine is, of course, the modified Onan industrial engine modified by Quickie Aircraft Corporation for use in the Quickie. The Quickie Engine Installation Package includes a finished propeller, Quickie engine installation plans, mounting hardware, throttle and carb heat controls, exhaust system, machine parts, miscellaneous materials, and one of the l5" x 21" color posters mentioned in the last newsletter. After April 25, 1979, the Quickie Engine Installation Package will also include the engine related instruments. The finished propeller, which QAC normally sells for $200, is being included at no additional charge. .....In the last 45 days, QAC has shipped out over 70 engines to Quickie builders who had completed their purchase of the Quickie Engine Package. The remaining engines being modified currently are sufficient in numbers to satisfy every Quickie Engine order for which we have complete payment. 1. Payment for the Quickie Engine is not due at time of order, but rather when the engine is ready for shipment. 2. Quickie builders who state in writing that they are ready to order a Quickie Engine will be placed on the engine list in sequential order. When their engine is ready for shipment, they will be notified to send in payment. .....QAC intends to keep in stock at QAC between five and ten Quickie Engines. These engines are for Quickie Builders who have ordered an engine as detailed above, and haye finished their Quickie prior to being notified that their previously ordered engine is ready for shipment. The intent here is to fully support any Quickie builder ready to fly who has ordered an engine and has previously received the Quickie Aircraft Kit and the Quickie Engine Installation Package. .....As a general guideline, new Quickie Engine orders may take 60 to 90 days Co satisfy; hence, the reason that we maintain five to ten in stock at QAC. .....In recent weeks, we have heard from at least 6 builders who are installing engines, finishing, and painting. Most of these individuals estimate that they will be flying in April or May. .....We have always stated that a realistic building time for the Quickie is 6 months to a year of a persons spare time; Quickie builders nearing completion have generally been building 6 to 7 months at this point. .....There is always an exception to the rule, and in the case of the Quickie, it is Lee Herron from New Jersey. He started his Quickie on 1 January, 1979 and in late March was down to painting and finishing. 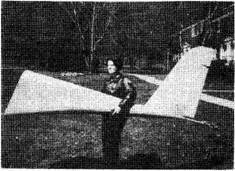 He estimates that he will be flying by 20 April, 1979. That is a remarkable achievement; especially since he has a job, a wife, and since he has spent many hours showing interested visitors his project. .....Another point that we have always maintained is that a Quickie builder should take his time and turn out a good product, since he will be flying his Quickie for much longer than it takes him to build it. We are pleased to see that the vast majority of Quickie builders are doing just that. Most of the parts that we have seen have had very good workmanship. One builder we know of is shooting for Oshkosh 1980 with a Quickie that he thinks will be good enough for the top Custom Aircraft award. It is interesting that he says that he thinks that our 400 hour estimate is reasonable, but that he figures by the time he finishes detailing his Quickie out for a show aircraft, that he will have probably 2000 manhours of working, and over 2000 manhours of thinking about ways to improve his Quickie. .....On 5 February, 1979, the Quickie was approved for construction in Canada by the NOT. We would like to thank Mr. Carry LeGare, Mr. Edward Slack, the Canadian NOT, and the Experimental Aircraft Association of Canada for working so hard on this over the last few months. Those of you familiar with Canadian homebuilt certification standards no doubt realize that most designs take years to gain approval, especially when they are departures from the normally accepted standards of performance and construction. .....Until 5 February, 1979 QAC thought it to be improper to market the Quickie in Canada. Now that approval has been obtained, Mr. Gerry LeGare, our Canadian Distributor, is busy selling Ouickies and supporting hoaebuilders. He expects to have his Quickie flying by this summer. Thus far, seven Quickie kits have been sent to Mr. LeGare.